Disability insurance is a type of insurance that pays you if you are unable to work due to an injury or illness. A disability ranging from a long-term illness to a disabling accident could end your career and put your financial stability at risk. Protecting yourself and those who depend on you is essential, and you need disability insurance to cover the loss of income you would face in unfortunate circumstances. The cost of disability insurance can be a huge factor in your decision-making process. With the various options and price differences, it is common for some doctors to end up making the wrong choice when choosing a policy based solely on pricing. The cost of disability insurance can vary for a number of reasons, such as gender, age, state of residence, medical specialty, elimination period, available discounts, benefit periods, policy riders, and more. In this blog post, we are going to share some different quote examples and help you get an idea about the cost of disability insurance. Disability insurance prices are individualized and can vary depending on age, specialty, state of residence, health history, age, and more. This makes it impossible to give an exact price; we will lay out a few examples, however, so you have a better idea of what policy costs might be. In these examples, each person submitted an online quote request that we then sent to the only 6 companies that provide true own-occupation disability insurance coverage. We then put together a personalized report to compare and determine the best option for their situation. During a meeting with one of our advisors, we then help people analyze their options and provide them with the information they need to feel confident that they are applying for the best disability insurance policy for them. 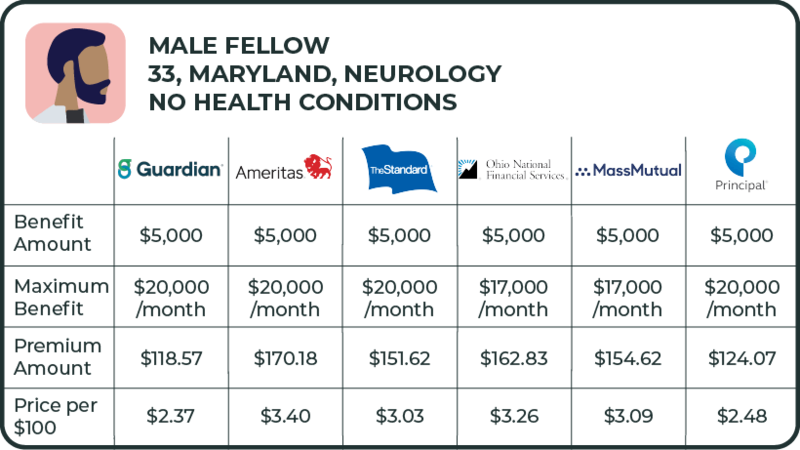 These rates are for a 33-year-old male neurology fellow from Maryland. He is a non-smoker and has no previous health conditions. The quotes show a $5,000 benefit amount with a 90-day waiting period, which is standard for long term disability insurance. The policy covers him up to age 65 and is non-cancelable, meaning the company cannot cancel his policy. This is a huge improvement over group disability policies that can be canceled at the whim of an employer. Based on the “Premium Amount” and “Price per $100,” Guardian would be the overall best choice in this example. Since this individual is a fellow, chances are once he is out of training and in his attending position, he will want to increase the policy. That is another benefit of individual disability insurance policies: you can increase your coverage as your income increases. So be sure to pay attention to how much it will cost to increase in the future as well as the premium amount when you are deciding which company to pursue. These rates are for a 32-year-old female internal medicine resident from Utah. Like the above example, she is a non-smoker and has no previous health conditions. 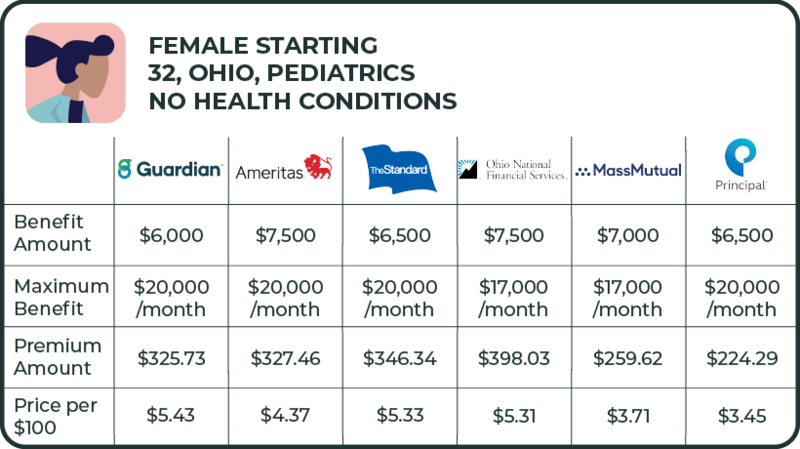 The quotes offer a range of benefit amounts from $1,000-$5,000 with a 90-day waiting period, which is standard for long term disability insurance. The policy covers her up to age 65 and is non-cancelable, so the company cannot cancel her policy. If we just look at the “Premium Amount,” Principal is the cheapest option. However, “Price per $100” would be cheapest with Mass Mutual. As a resident still on a small income, she may be interested in just locking in her discounts for a small amount with Principal. If she is okay with higher premium now, she may want to choose Mass Mutual and know her increases will not cost as much in the future. These rates are off the application of a 32-year-old female who is transitioning to her first attending position. Based in Ohio and with her specialty in pediatrics, she is a non-smoker with no previous health conditions. The quote report offers a range of benefits amounts from $6,000-$7,500 with a 90-day waiting period. It provides coverage up to age 65 and is non-cancelable. Starting practice amounts are used when a client is leaving training and moving into their attending position. They are standard amounts based on specialty. In this example, “Premium Amount” and “Price per $100” both lead to Principal being her cheapest option. Different factors can determine your prices for insurance. With so many factors, it is important to analyze your options beyond just the cheapest premium. The best way to find the cost of the right policy for you is to fill out a quote request and get a comparison of your options. At Pattern, our advisors provide you with the information and options you need to choose the best policy for the best price. With discounts, the right policy, and the right company, you are sure to find a policy that works for you. If you are interested in seeing your disability insurance policy prices, fill out a quote request and start the easy, fast, and simple process of getting your disability insurance policy.